I use the term Yamainu do refer to the wolf as the messenger of Yamanokami.
. habu ハブ / 波布 Okinawa pit viper . 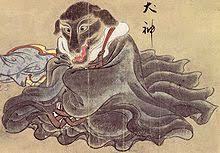 Japanese folklore describes Inugami as zoomorphic or anthropomorphic, dog-like beings, often similar to werewolves. They are masters of black magic and similar to the Shikigami. Like the possession of a fox, kitsunetsuki, it is a spiritual possession by the spirit of a dog, widely known in Western Japan.
. Inugami and Kobo Daishi 弘法大師 .
. Inugami from Oita 大分県 .
. Inugami and Legends with tofu 豆腐伝説 . 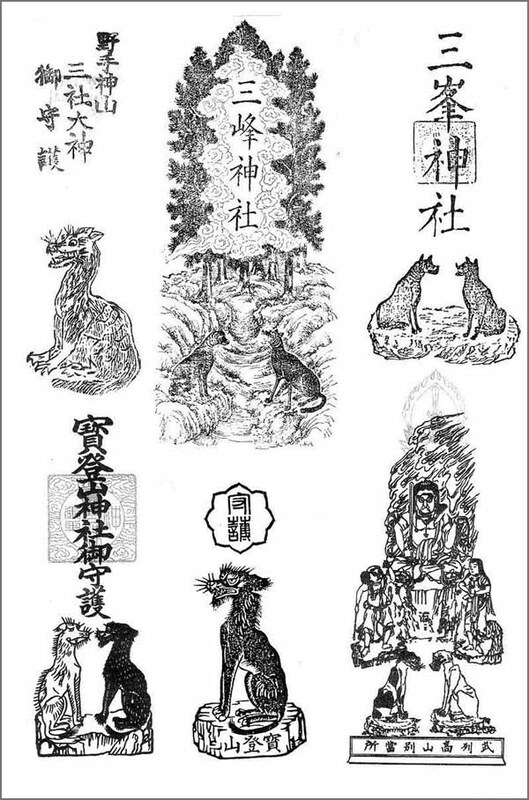 Its hands and feet landed in Tosa and became a dog deity 犬神 Inugami .
. yama-inu, yamainu　山犬、豺 "mountain dog" - wolf . Legends about the wolf, not related to Yamanokami.
. Wolf Worship in Japan . In the mountains live Yamanokami (Yamainu) and 天狗 Tengu. Deep mountains and high mountains are their special places and duly venerated. When building a new home, farmers tried to avoid the foot of a mountain protruding in a plain. This was the living space of the wolf, messenger of Yamanokami and of other mountain monsters. If someone built a house there, his family would be cursed. Possessed by the Serpent Deity they could not speak any more. Possessed by the Dog Deity they begun to bark like a dog. Possessed by Inari they begun to eat abura-age 油揚げ fried Tofu. Once a woman from the village married to a man in a different village, but because her family had a history of possessions, she took that with her and now this kind of possession happened in her new home and village too. Once an old woman was coming home from 岩松 Iwamatsu late at night, when Yamainu was surrounded by chirping sparrows. The Yamainu jumped around and made some sound too. At the entrance to 奥の院 the mountain temple people offer eggs, mochi 餅 rice cakes, vegetables or fish. o-te tsuita 御手付いだ "he has partaken of it". At the mountain temple are also votive tablets of Yamainu. They will keep away conscriptions to the army and protect from bullets. In 1883 someone got an amulet from Mitsumine Shrine and put it up. Since then the damage by wolves has subsided. As a messenger of Yamanokami he can hide in small amounts of grass (三寸の草がくれ). If people walked in the forest in olden times, wolves would come after them, so they hang a hinawa 火縄 glimmering rope from the belt. There were also many farmers being possessed by Yamainu. But the Yamainu would not bite a human, unless the human was lying on the ground, having fallen down. If the Yamainu was jumping over a human, he would pee and the urin come into the eyes, making the human almost blind. So while walking in the mountains, you better look down and do not stumble. The monkey (saru) is also a messenger of Yamanokami, so the word SARU サル was not to be used while working in the mountains. In the mountains is a road where evil spirits pass (Mashoosuji 魔性筋 Masho, Evil Spirit Road"). Even if farmers are in a hurry and have to take this road, they will hear strange noises. If they pray to Yamanokami for help. a wolf will come along and show them the road. Once a man was on his way back home from cutting tobacco leaves, but was very tired. From the place with the sanctuary of Yamanokami a Yamainu was following him until he was back home safe. If people get lost in the mountains, a Yamainu often comes to lead them to safety. If people spent the night in a mountain hut but have to go home fast for some reason, they must be careful not to meet monsters on the road. "Yama no Kami san tasukete kudasare" 「山の神さん助けてくだされ」Please, Yamanokami, come and help me! then two wolves come along and lead him the way home. Tengu as an incarnation of Yamanokami is quite wild, but Tengu is not an ancestor deity. The Tengu of this village is a monster with one eye and one leg. Also called Chinba チンバ (the lame one) in Matsumotodaira 松本平, the Matsumoto plain. Once a hunter wanted to have a young Yamainu and prayed to Yamanokami. He granted his wish and gave him two puppies. Once he went hunting but could not find anything, so he made a fire to rest. He said to the wolves: "I will have a bite and go to sleep here. Since I could not find anything today, you will have to go without food, I am very sorry." The wolves put their tails in water and extinguished the fire many times. He thought that was strange and climbed on a tree to have a look. He saw the wolves biting into his straw coat on the ground and finally realized they wanted to kill him. So he shot them. Then he prayed for their souls. At the 太子堂 Taishi-Do temple hall the object of veneration is the skull of a Yamainu. 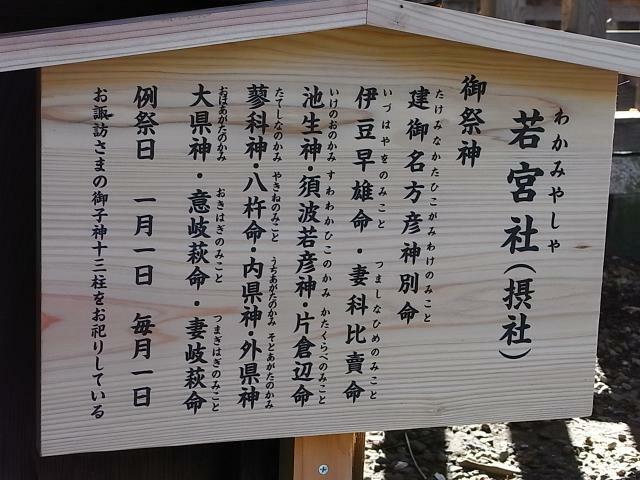 The 村松家 Muramatsu family takes care of the sanctuary. Their ancestor had once shot a wolve and then realizet it was a Yamainu, so he prayed for his soul and handed the custom down in his family. On the border between Nagano and Aichi there is a memorial mound called Mutsu Jizo (the normal reading is roku Jizo). This mound is not very old. Once during a strong rain six human skeletons were washed down and then buried and venerated here. The seventh man of this group had survived to tell the story. He had been rescued by a Yamainu showing him the way to the village 三河の富山村漆島 Tomiyama in Aichi. The Yamainu is venerated in this region as the messenger of Yamanokami.
. 貴布禰神社 Kifune Jinja and 狼様 Okami wolf rituals . Once a couple was preparing the mountain fields, burning down the bushes. When they took a break, ate their rice and made some tea, they forgot to make an offering of some ears of rice to Yamanokami. That night Yamainu were howling all night around their home. After that, they never forgot to make the offerings.
. Inugami and suikazura スイカズラ / 吸葛 / 忍冬 honeysuckle . In 徳島県三好郡祖谷山 the Iya valley of Tokushima there is a kind of Inugami monster called Suikazura. It is said to be a bit larger than a rat and lives in the warmth of the hearth in homes. 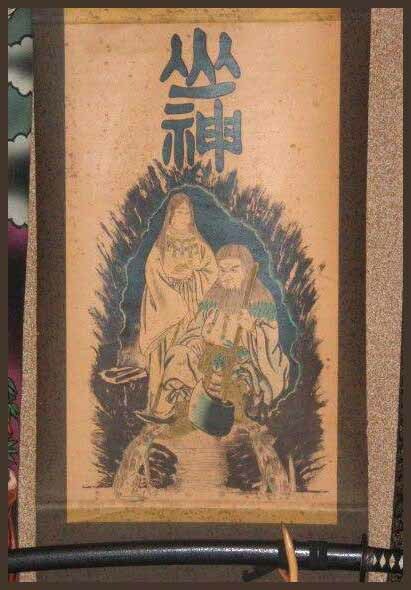 ２匹の山犬を両脇に従えた山の神。Scroll of Yamanokami with 2 Yamainu at his side. on the left his daughter 木花咲耶姫命（このはなさくやひめ) Konohanasakuya Hime.
. jūni sama 十二様 Juni Sama, "Honorable 12" mountain deities, .
. Waka Jinja 和歌神社 Shrines for Waka Poets .
. wakamiya 若宮 Wakamiya shrines .
. Wakamiya Hachimangu 若宮八幡宮 Shrines .
. Wakasa Kamo Jinja 若狭 加茂神社 and 若狭神宮寺 Jingu-Ji .
. Wanchan jinja わんちゃん神社 Wanchan Doggie Shrine .
. Wanigudhi Jinja 鰐口神社 Waniguchi temple gong Shrine .
. Watatsumi / Wadatsumi 綿津見三神 / 海神 Three Deities of the Sea .
. wara ningyoo 藁人形 straw dolls for curses . .
. Watarai no Miya, Wataraiguu, Wataraigū 度会宮（わたらいのみや）at Ise . A general term referring to a minor shrine serving the kami of a separate main shrine (hongū), or to its related kami. Shintō myōmoku ruijūshō; defines wakamiya as a shrine dedicated to the offspring (mikogami) of the kami worshiped at a main shrine, or to the newly apportioned branch of a shrine (see kanjō). In practice, however, the usage goes beyond this definition, in some cases being applied to shrines dedicated to the same deity as that of the main shrine, to deities other than mikogami, or to temporary shrines of the main deity (see otabisho). At first, many of the kami worshiped at wakamiya were kami of possession which revealed themselves through oracles delivered to priests (shinkan) and female shrine mediums (miko), but they gradually evolved from this earlier stage to the status of deities regularly worshiped at fixed shrines. It is from the way in which such kami were enshrined within the confines of permanent religious structures that some wakamiya are explained within the context of cults dedicated to goryō (vengeful spirits of the deceased). The first appearance of wakamiya in historical records is a mention of the shrine "Keta Wakamiya" in the province of Hida, within an entry of Nihon sandai jitsuroku for the 4th day of the 8th month for the year 873. Keta Wakamiya is believed to have been a shrine apportioned from the main Keta Honsha (presently Keta Jinja) in Noto Province. 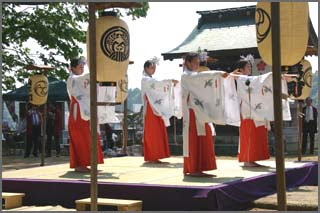 This incident indicates that wakamiya in the sense defined by the Shintō myōmoku ruijūshō were already in existence by the ninth century. Most examples of wakamiya are associated with major kami like Kamo, Kasuga, and Hachiman, but they possess a diverse range of features. Records from 881 mention a Kamo Wakamiya in Hida Province, another shrine apportioned at an early date. The first example of a Kasuga Wakamiya is seen in 1135, when one was dedicated by Fujiwara Tadamichi, but in fact, this shrine was a mikogami ("offspring kami") apportioned by acolytes of Kōfukuji as a means of enhancing their influence on the rites at the shrine Kasuga Taisha; as a result, the wakamiya's rites were observed independently of the main shrine's, giving it a strongly autonomous quality. 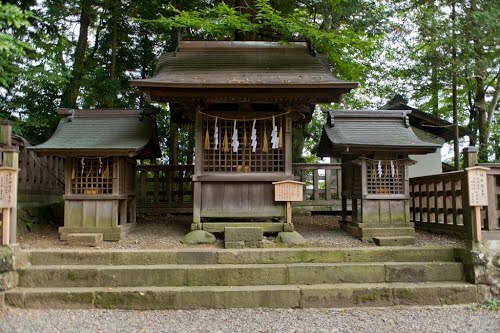 In the case of Hachiman, a large number of apportioned branch shrines are known by the name wakamiya. For example, the Sameushi Hachimangū enshrined at Minamoto Yoshiie's birthplace was also known as Wakamiya Hachimangū; its origins go back to an occasion when the portable shrine from Iwashimizu Hachimangū was carried into Kyōto. Likewise, the Azuma kagami refers to the shrine Tsurugaoka Hachimangū in Kamakura as a wakamiya, and the earlier established Yui-gō Hachimangū as a shimo wakamiya (lower wakamiya), demonstrating that many apportioned Hachimangū shrines in time came to be known as wakamiya. This shrine is also called Sugimoto Jinja 杉本神社 "Cedar Shrine", because of its location within an old cedar grove.
. Keta Jinja 気多神社 . Keta taisha(気多大社 - "Keta Big shrine" is the head shrine of Noto district, in Hakui Town, Ishikawa prefecture.
. WKD : bunka no hi 文化の日 (ぶんかのひ) culture day . Third of November, a national holiday. Wakamiya Ōji (若宮大路) is a 1.8 km street in Kamakura, a city in Kanagawa Prefecture in Japan, unusual because it is at the same time the city's main avenue and the approach (sandō (参道?)) of its largest Shinto shrine, Tsurugaoka Hachiman-gū. Over the centuries Wakamiya Ōji has gone thorough an extreme change. A heavily trafficked road today, it used to be, to the contrary, off limits to most people as a sacred space. Immediately after the Torii gate begins the dankazura (段葛), a raised pathway flanked by cherry trees which becomes gradually wider as it goes toward the sea. At the time of the Kamakura shogunate it was an essential part of the city's religious life, and as such it hosted many ceremonies and was rich with symbolism. Since its construction Wakamiya Ōji has been the backbone of the city's street planning and the center of its cultural life. The street has been declared a Historic Site and was chosen as one of the best 100 streets in Japan. There are 13 "venerable pillars　柱" as children of the deity. Yashimajinumi no kami, Itakeru no kami, Ōyatsuhime no kami, Tsumatsuhime no kami, Ōtoshi no kami, Ukanomitama no kami, Ōyatsuhiko no kami, and Suseribime no mikoto. Within the precincts (keidai) of the shrine Dazaifu Tenmangū, an associate shrine (sessha) is dedicated to Sugawara Takachika and Sugawara Kageyuki, offspring of the shrine's principal object of worship, Sugawara Michizane. Another example of mikogami is found at Kasuga Taisha-the Fujiwara clan shrine (see ujigami) -where one of the deities worshiped is Amenokoyane no mikoto, claimed as ancestral deity (sojin) of the Nakatomi clan. 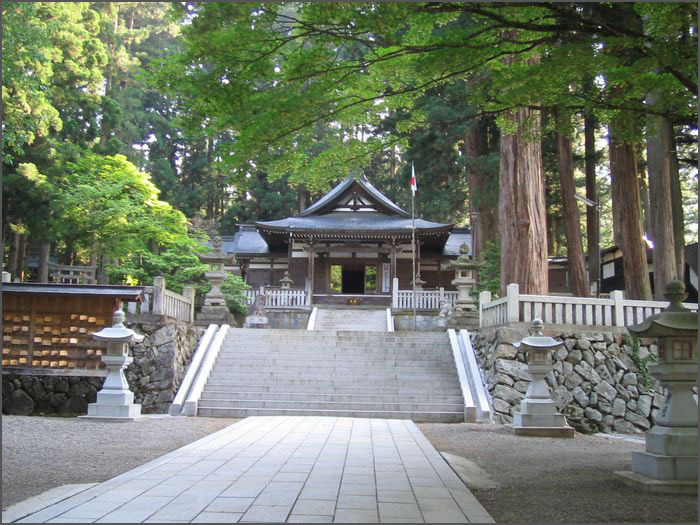 In turn, an affiliated shrine, Wakanomiya Jinja enshrines Amenooshikumone no mikoto, the divine offspring of Amenokoyane. Kasuga's Wakamiya shrine, however, was established in 1135, promoted as part of the move by acolytes of the temple Kōfukuji to control Kasuga; at the same time, its worship was also closely related to the belief in goryō (vengeful spirits of deceased persons of high rank), which came into vogue during the late Heian period. Further, not all wakamiya enshrine offspring of the central deity; some are dedicated to the central deity's parent or ancestral deity, and some act as temporary enshrinement sites (anzaisho, karimiya) for the central deity when it travels from its original shrine during festivals. For this reason, the mere presence of a mikogami does not necessarily indicate the shrine is a wakamiya.
. Wakamiya Hachimangu, 若宮八幡宮 Mie .
. Mikogami ミコ神 / 御子神 legends from Okayama . Three shrines at Suwa - Wakamya shrine is in the middle. Jan 16th in lunar calendar, corresponds to Feb 25th in 2-013. Kamo Jinja Kamisha (加茂神社上社; upper-left in the picture) in Wakasa, Fukui. Oikemono Jinji is an annual and unique ritual to perform divination of this year's harvest, and it was continuously held since about 1000 years ago. One year ago, seven kinds of tree seeds (e.g. acorn; upper-right in the picture) were put into a cedar box and has been placed below ground for a year at a special place in the precincts. On the day of ritual, the cedar box will be grubbed up, and new seeds in a box will be placed at the same location instead (lower-left in the picture). The old box will be open up at the shrine's meeting hall by the shrine parishioners to look over the seedling (lower-right in the picture). If they find the buds and roots grow well, they make a declaration of promise for good crops in this year (even if not, they still make a "hopeful" declaration). It is believed that the enshrined deity "Yama-no-kami (山の神)" is involved in the seeding. This is very interesting and primitive animism-style ritual which we must conserve generation to generation. Interestingly, this ritual is not only religious but also scientific. And more interestingly, this shrine doesn't have a building at all. As shown in the picture, there is only an Iwasaka (磐境, or Himorogi 神籬), which is a swath of sacred land surrounded by rocks. This is kind a primitive shrine.
. Yama no Kami 山の神 God of the Mountains .
. Uwase Shrine (宇波西神社), Mikata, Wakasa .
. Jinguuji 神宮寺 Jingu-Ji . (with a photo of the inner sanctuary 若狭神宮寺内陣. A stone altar or cairn erected in ancient times for the purpose of invoking the presence of a kami at times of worship. 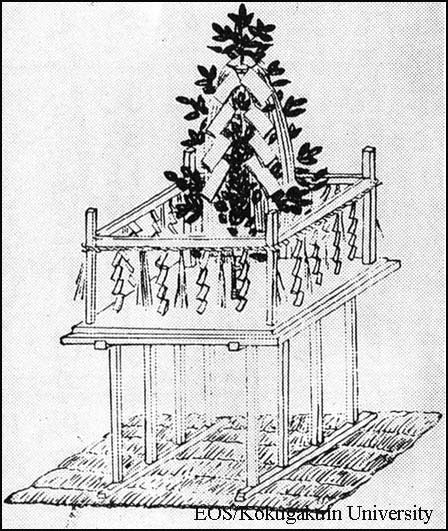 According to an "alternative tradition" describing the episode of the "Descent of the Heavenly Grandchild" (tenson kōrin) in the Nihongi, Takamimusubi erected a "heavenly himorogi" (divine tree) and "heavenly iwasaka" for the purpose of paying ritual worship to the divine grandchild. This passage thus indicates that both himorogi and iwasaka were built together. 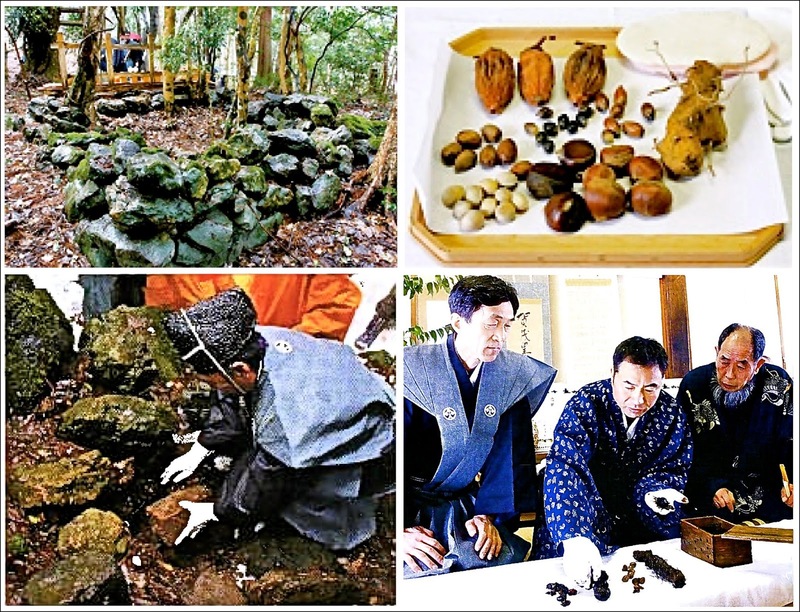 Debates have continued since the Edo period regarding whether actual stones were used in such structures and it was thought that none of the actual sites would ever be discovered. To a limited extent, however, evidence from sites of rock cairns like the Taki-matsuri no kami within the Grand Shrine of Ise; the temporary shrines of the festival confraternities (kō) in the city of Sakurai, Nara Prefecture; and other archaeological discoveries suggest that relatively small rocks were collected within delimited areas to be used as a "divine seat" or altar for worship. 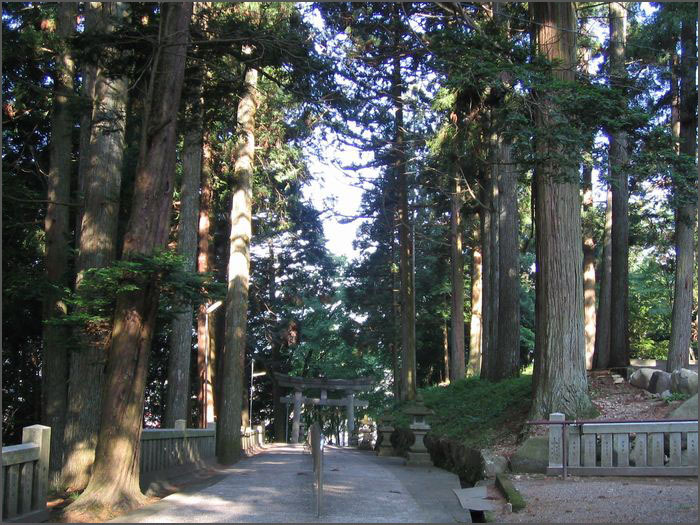 Further, most such sites seem to have been decorated with a himorogi or a branch of the sakaki tree. Such iwasaka were either square or round, and represented by a raised cairn of stones in a flat area, although in some cases they appear to have involved a somewhat larger stone placed in the center of the cairn. Some theories suggest that the word is synonymous with iwakura.
. iwakura 岩座 ／磐座 sacred rocks . Originating in ancient times, himorogi refers to a temporarily erected sacred space or "altar" used as a locus of worship. Today, himorogi are represented by the demarcation of a physical area with branches of green bamboo or sakaki at the four corners, between which are strung sacred border ropes (shimenawa). 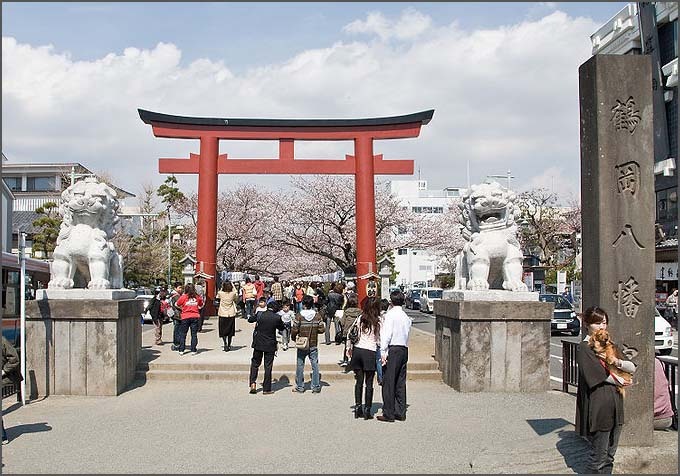 In the center of the area a large branch of sakaki festooned with sacred emblems (hei) is erected as a yorishiro, a physical representation of the presence of the kami and toward which rites of worship are performed. In more elaborate cases, a himorogi may be constructed by placing a rough straw mat upon the ground, then erecting a ceremonial 8-legged stand (hakkyaku an) upon the mat and decorating the stand with a framework upon which are placed sacred border ropes and sacred border emblems. Finally the sakaki branch is erected in the center of this stand as the focus of worship. Since the Edo period, various attempts have been made to understand the derivation of the word himorogi. Early appearances of the word include the expression "heavenly himorogi" (ama tsu himorogi) in the account of the "descent of the heavenly grandchild" (tenson kōrin) as found in "alternate writing" outlined in Book II of the Nihongi. 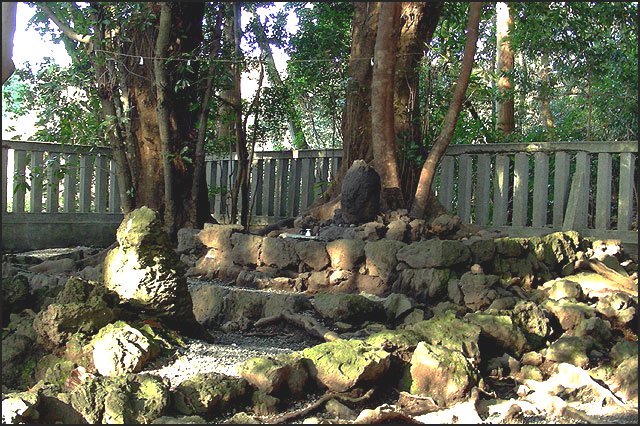 The word also appears later in the Nihongi in the account of the reign of Emperor Sujin, where it states that a shikataki himorogi (probable meaning: "an altar of firm stones") was erected in the village of Yamato no Kasanui and used for the worship of Amaterasu ōmikami. A passage from the reign of Emperor Suinin relates that of the "divine treasures of Izushi" (Izushi no kandakara) brought by the Korean prince Amenohihoko, one was called a kuma-himorogi (meaning obscure). The Man'yōshū likewise includes phrases such as "though I dedicate an altar on the divine mountain" (kamunabi ni himorogi tatete iwaedomo), making it clear that these expressions refer to temporary altars constructed for worship. During the Aoi Festival at the Kyoto shrine Kamo Wakeikazuchi Jinja, the "sacred seat" (miare dokoro) is represented by a square space surrounded by green branches, in the center of which is placed an evergreen tree, and this structure can likewise be considered one form of the practice in which a kami descends to a space surrounded by such sacred borders. Other practices related to this custom might include the sacred fences (mizugaki and shibagaki) found surrounding shrines, and the fence of branches surrounding a new emperor's enthronement palace (Daijōkyū).